The modern, ivory rose with a touch of glitter hand-tied bouquet comes complete with white foliage, glittery organza and pearl bead loop decorations. Bouquet head measures approximately 22cm in diameter. The modern, ivory rose with a touch of glitter hand-tied bouquet comes complete with white foliage, glittery organza and pearl bead loop decorations. Rose heads measures approximately 4cm in diameter and there are approximately 30 roses in this bouquet and the bouquet head measures approximately 22cm in diameter. 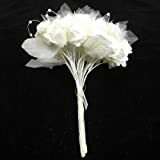 This entry was posted in Wedding Store and tagged Bouquet, Brides, Foam, Glittery, HandTied, Ivory, Loops, Organza, Pearl, Rose by Formal Affair. Bookmark the permalink.